Remember how cafeteria food was cheap and tasteless? That’s not the case here! They have Happy Hour Menu called as “Recess”, from Monday to Friday 4 – 7 pm, and you’re getting a bargain. 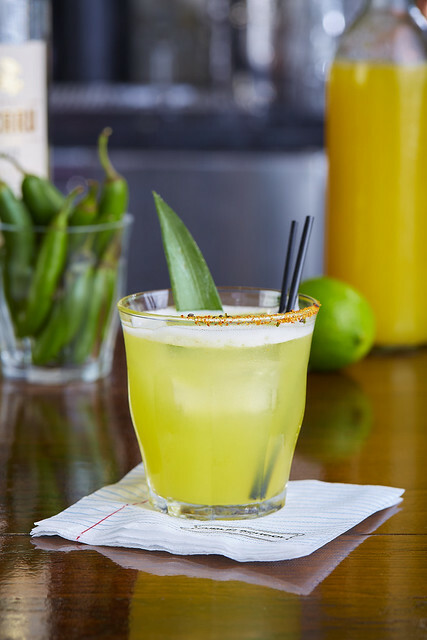 With a price range of $4 - $7, Executive Chef Phil Kastel (formerly of Hillstone Restaurant Group in Newport Beach) is serving up international flavors – Crispy Ahi Tuna Tacos, Adobo Tacos, Dip Duo (hummus & baba ganoush), Margherita Pizza or an American quintessential like PB&J sliders or 3 mini cheeseburgers. 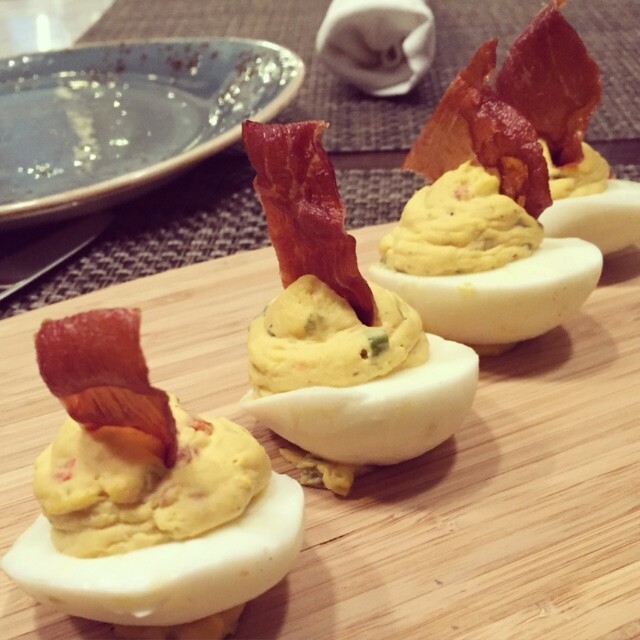 I loved their Eggs & Speck ($5) – deviled eggs with crispy prosciutto. Prosciutto’s crispiness was superb and had the right amount of saltiness. As far as drinks go, beers go for $4 - $5, well drinks at $5, and “Dean’s List” half liter wines priced at $10 or $15. Moving along to the dinner menu, I thought there were many interesting options. I had the chance to try their Fiery Calamari, Bacon Cheddar Tots and the Jidori Chicken & Green Chili Cornbread Waffles. If my stomach were bottomless, I’d probably try their Shrimp & White Cheddar Grits, Dragoons Irish Stout Short Rib, and the Colorado Lamb Burger. A second visit is due SOON! Nevertheless, what I had was really good. The Fiery Calamari had a good crunch while the togarashi dusting adds an interchange flavor of spicy and salty. I also appreciated how the crust was light and thin, just a graceful transition to bite into the supple cuts of the squid. 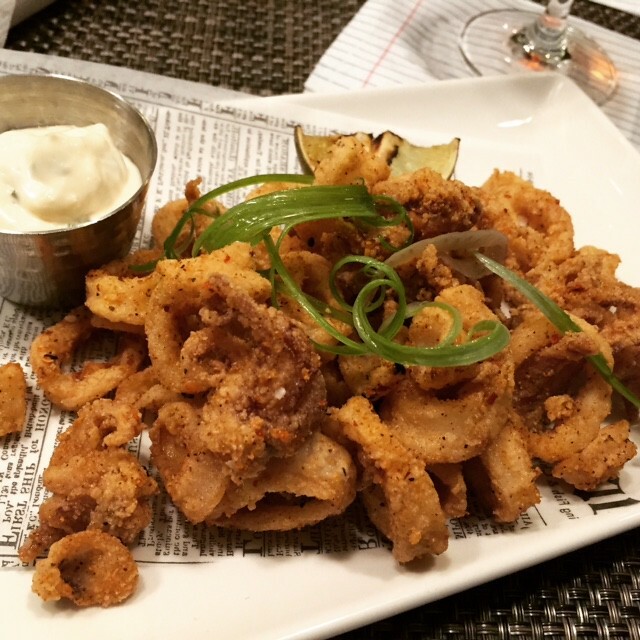 The person sitting next to me was flabbergasted on how I finished a whole basket of calamari before dinner started – yes those fritters with garlic aioli was just that GOOD. 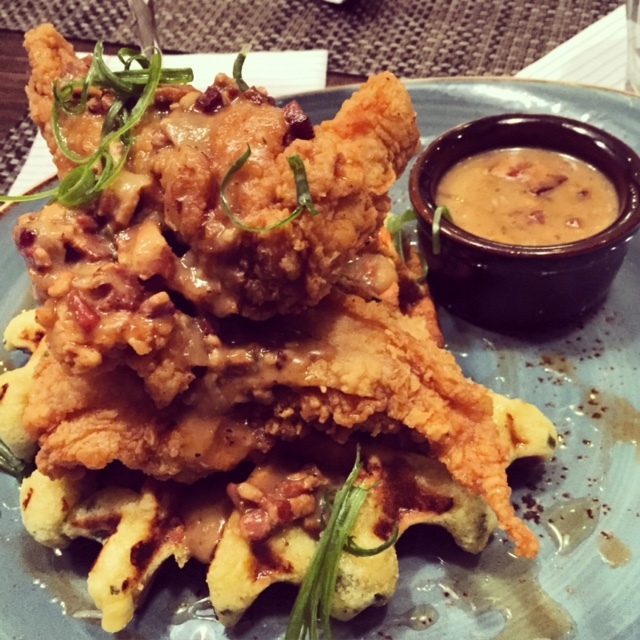 For the main dish, I had the Fried Jidori Chicken & Green Chili Cornbread Waffles with red eyed gravy, Louisiana hot sauce and maple syrup. I thought the fried chicken here was well-spiced, with a good crunch on the skin. It has hints of sweetness and heat. I don’t know about you but I still prefer my fried chicken on the moist side – I wished these chickens weren’t so dry. Luckily, the homemade gravy saved the day! Gravy was hearty – thick in texture, beefy, buttery and very flavorful. As far as the waffle, I thought it was spot on – crisp, light, satisfying. I liked how I could still taste the buttery goodness of the waffle without getting swayed into the sugary sweetness of the maple syrup. 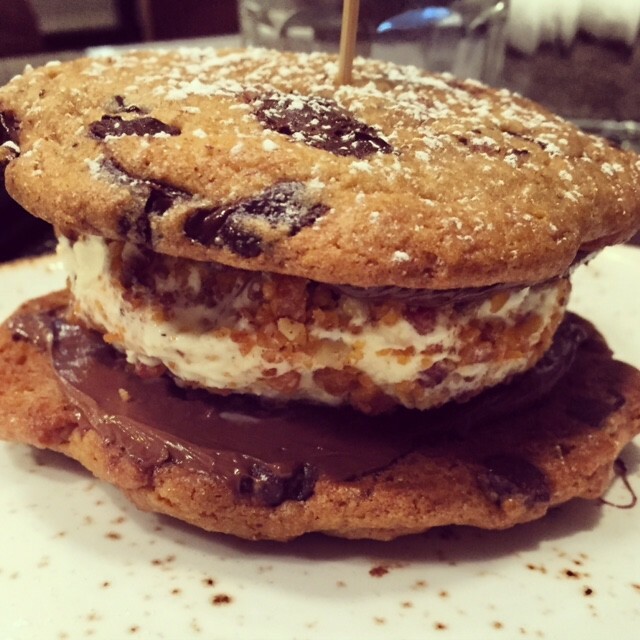 Finally, for dessert, I had the Nutella Cookie Sandwich – bacon brittle, chocolate chunk cookies, and vanilla bean ice cream. It was rich, hearty, and out of this world. I could only eat half of these. I wished I started dinner with sweets. Future diners, I’d recommend you get this sandwich before any appetizer or main course. Cookies were thick, chewy, buttery, and exploding with chocolates – I loved it! The bottom cookie was smothered with Nutella – Chunks and Nutella – these are what Chocolate dreams are made of. Then, in between the cookies, you have a big scoop of vanilla ice cream drenched with bacon bits – trust me, this is easily one of the best desserts I had in years. 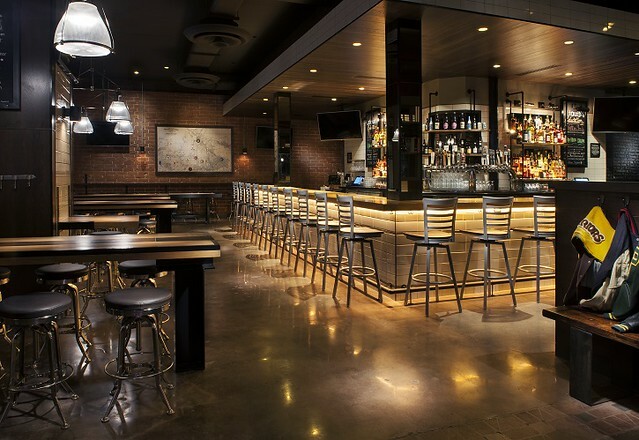 All in all, I thought Public School 818 is probably my new favorite gastropub in the Valley. It’s definitely one of those places where you can pop in for a quick drink with friends without compromising on food quality. 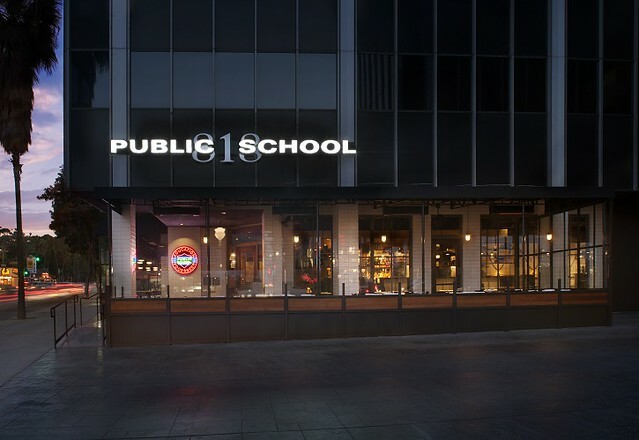 It is evident in the menu and drink selections that Public School cares to curate the best and explore with interesting ingredients. I do wish they have a more expansive dessert menu, though. Tidbit aside, I can honestly say I can’t wait to go back to school.